Unless you are living under a rock you probably have heard at least a little something about Anna and the French Kiss. Maybe how squee worthy St Clair is or how it is the best type contemporary fiction out there. And you know I'd definitely agree with all of that. It was just a fun book but not a fun book you'd just brush off and go on your way, a fun book that stays with you. If every book had just a little bit of Anna's magic that would be a dream come true. I really adored the setting of this book, boarding school in Paris, can you say jealous? I know I can. It sets the stage for Anna and what a beautiful stage it is. And St Clair, what a sweet character. I really think this book could become a wonderful movie. All the lusting these kids do it's crazy! I'm going to keep this review brief but I wanted to touch on the very few things that bothered me in the book, I thought Anna cried a bit too much, I mean yes she's a teen, far away from home and going through some emotional stuff, but still. Too much. And the way something played out (vague to avoid spoilers), I wasn't so happy with it, but oh well. Luckily I've had the chance to read Stephanie Perkin's next book, Lola and the Boy Next Door, the companion to Anna and I like it even more! Ahh Stephanie Perkin's has a gift and I hope she never stops using it. Speaking of Lola, I have an extra copy I want to give away to one of you! 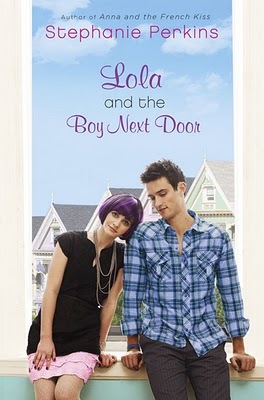 Here's how to enter to be the winner of an ARC of Lola and the Boy Next Door ! Fill out the entry form here. Entries left in the comments of this post will not be counted. You must be 13 years or older to enter this contest. The giveaway will end August 17th at 6:59 pm Central Time. I'm asking for your address straight up. I will also email you so you know you have won. I will delete the spreadsheet once I have got the winner's information. Seriously I must be one of the last people on the planet to have NOT read this book. Even though it is, at this very moment, sitting on my shelf pouting. I haven't read Anna yet, but I do have it and hope to get to it soon. Thanks for the giveaway! Anna was incredible! I bought the e-book so that I always have it with me whenever I want to read it - it's that good. Thanks for the chance to win Lola, I'm sure that everyone who read Anna is anxious to get this one asap. Ah! I haven't read Anna yet but since you say Lola is just as good if not better, why not start with Lola right? =P I hope I win! I loved Anna and I'm hoping Lola is just as great. Thank you so much for the chance to win a copy. I can't remember if I entered in this contest, so I may have accidentally entered twice! Sorry, I have the memory of a goldfish. Paris is like another character in this novel, it literally breathes. You can see, hear, and taste the city in every word the author writes. As someone that's been to Paris, I can tell you that this is an incredible feat and allows the city to be truly magical. I adore this novel and I will definitely be reading more from Ms Perkins! She has a real gift for showing the honesty, heartache and humor that love can bring!